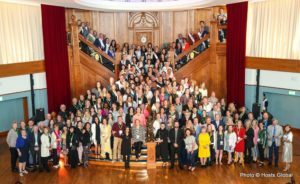 Hosts Global (Hosts) crossed “The Pond” and welcomed more than 200 clients and hospitality industry professionals to Belfast, Northern Ireland for its sixth annual Hosts Global Forum, which was held June 21-24, 2018. Hosts’ 2018 conference highlighted the wide variety of venues and activities that Belfast has available for group programs, meetings and events. The conference was made possible with the support of three platinum sponsors: Tourism Northern Ireland, Hastings Hotels and Moloney & Kelly, a Hosts Global member. and the chance to experience Northern Ireland’s famed hospitality at a range of unique venues, including Titanic Belfast, Belfast City Hall (transformed for the evening reception into the fantastical land of C.S. Lewis’ Narnia), and The Dark Horse (whiskey tastings and live Irish music). At the close of the conference, Hosts announced that its 2019 Hosts Global Forum is being held June 27-30, 2019 in Punta Cana, Dominican Republic, and that Connect Travel Services DMC, a Hosts Global member had already started planning for the event. Meeting and incentive travel planners interested in attending the 2019 conference should email Hosts at HostsGlobalForum@hosts-global.com for information and qualification criteria.